It doesn't take a truck load of furniture to make an impact at your event. Mini lounges, even micro-mini lounges with just a few pieces, can add a focal point and a special element your guests will love. Here are a few examples of lounges that use fewer than 3 pieces of furniture. Two ottomans, a few pillows and a throw can seat numerous guests and is super cost effective. Two upholstered chairs and a few rustic wooden crates create a great photo opportunity. How simple is this? I *heart* a simple sofa + coffee table. 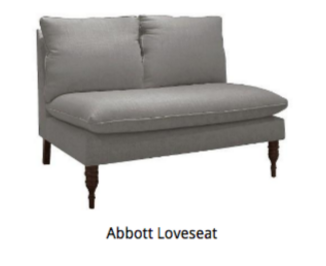 Toss some pillows on top a love seat (just like our Grand! ), a side table and a bench for a perfect mini-lounge. Another chair and side table mini lounge option. Grey on grey on grey. 3 pieces. Love seat + rug + side table cluster = mini lounge love. Such a sweet and simple photo backdrop. Of course, I wish that pillow said Illinois.